Colonial Home, moderno, ventoso, colorido y acabados de alta gama, lavadora / secadora, cocina totalmente equipada y barbacoa disponible. La propiedad tiene techos de 18 pies, cuenta con 2 amplias habitaciones con baño completo que consta de mármol y características de piedra de ónix. Pisos de piedra caliza se presentan en toda la residencia, la característica principal de la propiedad es el hermoso patio interior que alberga una fuente de peces tallados en piedra caliza. La cocina cuenta con electrodomésticos modernos, hornillo con estufa a gas de 6 quemadores, refrigerador / congelador completo, además de refrigerador de vino para mantener sus bebidas frescas en los días calurosos. House está ubicada en una tranquila y pintoresca calle maya, a las 7 a.m. abres la puerta y ves a mujeres mayas sentarse a chismorrear / lo mismo sucede al final del día cuando sacan sus sillas para hacer bordados con la brisa de la tarde. A las 10-11 a.m., el conductor de la tortilla se detiene en la cuadra. Hay una tienda de variedades convenientemente ubicada, al lado de la propiedad, donde tienen todo, como bebidas frías y suaves, leche, frutas, verduras, tortillas, tarjetas telefónicas, etc. Un negocio familiar cercano ofrece agua / leche de coco recién cortada por litro, en un plazo de dos horas. Not only was the house beautiful, but Sora is a great host. She was very responsive to our needs and always reachable. The place is well maintained and equipped. The photos are exactly as the place really is. We had a rental car and the street parking directly in front of the front door was always available. It's close to the historical district (about a $US 2 Uber ride ). I recommend this place . whole-heartedly. We stayed over Christmas and New Years 2018/19 and were delighted with the property from the moment we entered. Pre-arrival communication with Sora was seamless and uber prompt and as we were arriving Christmas day, she recommended, and called to confirm availability, a ton of restaurants that would be open. The home is beautiful, quite grand coming from NYC apt living. The two bedrooms are in the back of the property and are quite large, each with their own AC units. The kitchen is fully equipped, although we never cooked during our stay. The washer and dryer were an extra perk, especially with the diversity of day trips (Celestun, Izamal, Uxmal, etc) and variety of clothes we went through. It was 90 degrees during the day. When confronted with a car rental issue (no cars after having a confirm #/email) she connected us with her friend Jorge and for the same price as a weekly rental, he took us to each of the above day trips. Without Sora's inside knowledge, helpfulness, and responsiveness, we would not have had such an enjoyable time in Merida. 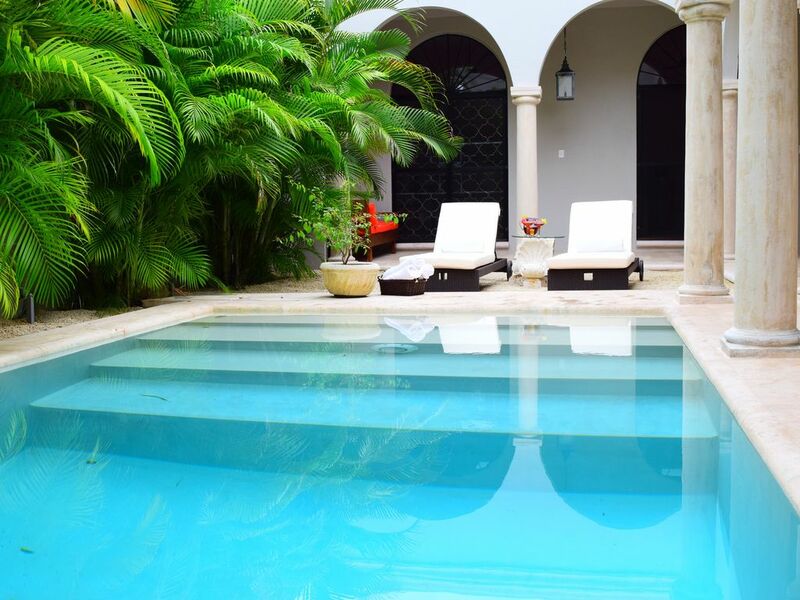 The pool and garden area were a refreshing escape from the heat after meandering the streets of Merida. The cleaning woman came MWF during our stay and cleaned from top to bottom each time. Although, it's a 22 minute walk to the Cathedral we ubered 26 times during our stay for a total of less than $50, Uber was so convenient and free by NYC standards. You could walk, but we had my 73 yr old father and with the heat and it woudn't have been fun. There are local bodegas near the property for basics or the main markets in town were readily accessible. We definitely return to this property when we come back to Merida. If I could rate this higher, I would. We have stayed in many VRBO's before, though none with the flair and style of this beautiful home in Merida. The art, furnishings and design are unique, and we loved that it was within easy walking distance of many restaurants and sights. Sora was a pleasure to work with, and her suggestions for activities meant that we had a truly memorable vacation. Would stay there again and highly recommend this to anyone wanting an oasis in this pretty city.